Well, for the most part, these reels are great for beginner fishermen and children. 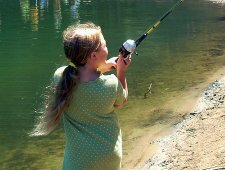 They are hassle free, which allows the beginner to experience the excitement of fishing without having to deal with the worries of backlash and tangles. 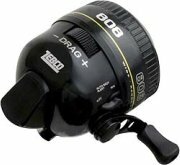 Best of all, technology is ever improving these fishing reels to better suit, and adapt to a wider audience of anglers. Spincasting fishing reels are also known as closed-face spinning reels or push button reels. They are very similar to baitcast reels and spinning reels. They sit on the top side of a casting rod and have a push button like a baitcast reel does. And they have a fixed spool as such the spinning reel has. These reels have a closed face enclosure like the underspin reel has. The closed face enclosure is usually a rounded hood with a hole that allows the fishing line to pass through. This enclosure can be made from hard plastic materials, or rigid metals such as aluminum alloy. The enclosure houses the spool system and other components, and prevents the line from backlash. The newer models have increased the hole size for smoother and longer casting. One nice thing about these reels is that they come pre-wound with fishing line. They usually have light line of 6 or 8 pound tests. However, they can also be found with heavier pound test lines of around 15 to 25. Monofilament line matches up best with these because it provides smoother casts, with less resistance than braided line would. Although, braided line can also be found pre-spooled into these reels. Spincast fishing reels are suitable for most types of freshwater fishing. They are great for catching small panfish. Or can also offer a nice challenge for playing out larger game fish. They can also be used for saltwater, but not too often... unless you're up for a challenge? Manufacturers are ever improving their models and are continuously upgrading their gear retrievals, drag systems, and handles, making it that much more fun and exciting for everybody to use. The majority of these have ball bearing gears for smoother operations, and anti-reverse mechanisms for nice hook sets. They are best suited for light tackle. However, higher gear ratios of 4:1 are just as common to find with these reels, allowing it easier to fish a wider variety of lures properly. All of these have external adjusting drag systems and many are very good, but probably not as good as open-faced tackle will have. Like other types of reels, these come in left and right handle retrieves. Different styles include soft touch, single grip, and double grip, just to name a few. 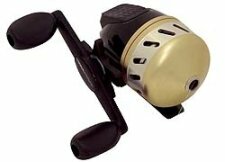 To cast a spincast reel, press the button with your thumb (pressing the button secures the fishing line), with the rod tip angled behind you at about the two or three o'clock position. With your eyes on the target, make a forward cast by swinging the rod tip forward and releasing your thumb free of the button at around the 10 o'clock position. Pressing the button again will stop the line from continuing to go off of the spool. When the line is being reeled in, by cranking the handle, a pickup pin is wound inside the hood to retrieve the line around onto a cup. Some reels have more than one pin which allows for a faster retrieve. Though these reels have a closed face and are generally inexpensive, proper care and maintenance should still be taken to ensure that they last for a long time to come. Because of the closed face, it can be difficult to do so, with the extra measures to go through. Keep it free from sand and dirt. Store in a dust free environment and/or use a protective cover for you equipment. Lubricate your reel and its parts as needed, but sparingly and yet efficiently. Use only recommended reel lubricants instead of WD-40. WD-40 clunks up over time, which will ruin your equipment and doesn't allow for smooth casts and retrieves. I learned that the hard way many years ago. I destroyed one of my favorite reels listening to somebody's bad advice about reel lubrication. Real Magic is a very good recommended brand that is versatile for many other uses as well. Some of the better manufacture companies that produce spincast fishing reels include Daiwa, Shakespeare, and Zebco. Shop For New Spincast Fishing Reels Here.